As I look back on 2011, I couldn’t be more pleased with the phenomenal growth that the winery has experienced. I wanted to build the business organically through word-of-mouth referrals and given our 400% growth for the year, this plan is clearly working! For 2012 we have only one New Year’s Resolution: to continue the growth of our spirited wine club community as we embark on the establishment of our private membership-only winery estate, or should I say, Country Club. Once we reach membership capacity, we will close the membership and start a waiting list for potential future members. The goal is to make weekend wine tasting, picnicking and private winery events available exclusively to our members. Bring your family, guests or even business associates to the winery for the ultimate wine country experience! Help us build the Regale family. We encourage members to bring like-minded friends up to the winery to show them what we are all about. For the first half of 2012, the member who refers the most new members will receive a private wood fired pizza party next summer for themselves and 25 guests! All on us, including wine! 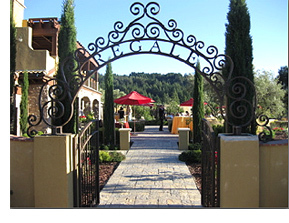 For the second half of the year, the winning member will receive a private wintertime party at Regale with the entire winery to yourselves!!! Below please find our 2012 schedule of private, members-only events. New for this year is the April Tax Relief Event, our May Culinary Class, Summer Luau, Valentine Celebration and Father’s Day BBQ. In addition, we will have our traditional Harvest Celebration, Oysters and Sparkling Wine, Paella Fiesta and Winter Holiday Party. For all of these parties, we will close the winery to the public for the day. Most of these events are FREE and a few have minimal charges. Join us for complimentary wine tasting, sweet and savory appetizers, chocolate tasting, and live music. Special wine discounts available that day only! This special event is for members and their guests only (four tickets are allowed each member.) Due to the popuparity of our events, we have two parties that day to choose from; 11am to 2pm or 3pm to 6pm. Attendance is limited, so we are “selling” tickets on line. THERE IS NO CHARGE for the event at all, but in order to attend you must “purchase” tickets online. To purchase your tickets go to http://www.regalewine.com. Complimentary wine tasting,light appetizers, live music. First annual spring cooking class, dinner paired with Regale wines. Complimentary wine tasting, delicious BBQ, live music. Complimentary wine tasting, live music, Luau style BBQ, The “Rubber Chicken” Olympic Games. Oysters and Sparkling Wine with music… need we say more! An annual tradition not to be missed! Complimentary wine tasting, soups and harvest dishes, live music. Complimentary wine tasting, live music, special holiday appetizers.